Exeter boss Rob Baxter says his side's poor recent form has cost some of his players a place in the England squad. Jack Nowell has been named in Stuart Lancaster's senior side, while four Chiefs players are in the Saxons squad. 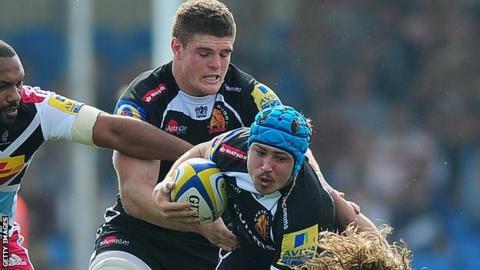 A four-game Premiership losing run has seen Exeter drop out of the top four. "There's no doubt that part of us not performing well as a side has meant that those individuals haven't quite performed at the level they were previously," Baxter told BBC Sport. Chiefs players Luke Cowan-Dickie, Thomas Waldrom, Henry Slade and Dave Ewers have been called up by the Saxons, and all but the latter have been in the senior squad in the past year. "There are some quality players in ahead of them who have put in some consistent performances and are playing at clubs who are consistent," Baxter added. "Maybe as a club, and for those lads as a group, we haven't been able to put our best foot forward in some ways for them all to have their best opportunity to get selected at the highest level, because we had a bit of a sticky patch in the Premiership. "Being recognised by Saxons is still very important to us, having Jack in the senior squad is very important, but it does feel that as a group we've not been able to push those guys forward."